Becky already had enough to worry about. Her home was one of the many thousands of homes that had been impacted by the recent flood that devastated so much of this area. 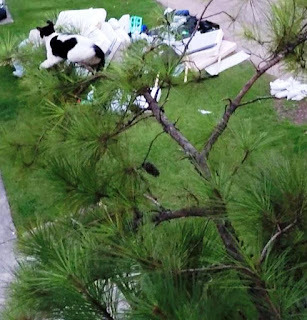 She was working to tear out all the damaged drywall and pile it in front of her house along with all the other ruined furniture and debris. She didn't need to have her cat, Spike, get stuck in a tree and give her more to worry about. Becky found out about me through Cat Haven, a local cat welfare organization where she volunteered. 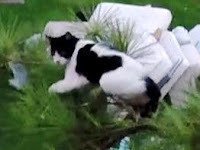 When she called me in the late afternoon on Spike's fourth day in the tree, I had just finished mowing my yard and was already tired and dehydrated, but I did not want to keep Becky and Spike waiting any longer. After I cooled off and had a bite to eat, I went out there and drove down her street which was lined with flood debris in front of almost every house. There I found Spike resting about 15 feet high in a pine tree that was covered with assorted vines. Spike had a feral history, but he was tame to Becky. Even though she thought he might be friendly toward me, I knew to expect otherwise. Still, I always want to give a cat a chance to be cooperative and get down the easy way, and when I climbed up to his level, he did indeed appear calm, and he stayed in place. He let me get within just a few feet of him with no signs of stress. Maybe there was hope for a cooperative rescue after all. He was resting on a branch which was surrounded by vines. I was close and could see him, but getting closer to him would require that I remove the tangle of vines between us. I first tried to get him interested in some food to gain his trust, but he was not interested. I was hoping he would come closer to me for the food, but even when I placed it very close to him, he ignored it completely. Rescue by carrier or cat bag was not an option. The only thing I knew to do was to climb higher above him and then descend toward him in the expectation that he would become uncomfortable with my approach and then move either farther down the tree or at least out on his branch where there were no vines. Indeed, as I descended toward him, he moved farther out on his branch, so I tried to position myself in a place where I could reach him with the rescue pole. 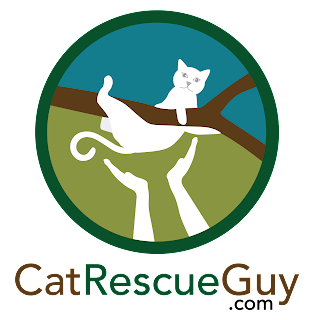 In all the rescues in which I have used the rescue pole, I have always been pleased to see that none of the cats has ever appeared to be stressed by the approach of the pole toward them. They often appear curious about it, but never have they appeared threatened by it. Spike, however, was the lone exception. As soon as the pole got close to him, he walked farther out on his branch to get away. Unfortunately for me, the branch Spike was on was a very long one. In order to get close enough to reach him now, I would need to walk out on the branch as far as I could. In order to do that, I needed to climb back up the tree and reposition my climbing line around some limbs. After I did that, I walked out on the limb and secured myself to two additional branches with my lanyard. I went out as far as I could on the limb without breaking it with my weight and again tried to reach Spike with the rescue pole. I still had to extend the pole out to over 10 feet to reach him. It is very difficult even under ideal conditions to hold the weight of the pole out that far with enough control to precisely position the noose around his head and under his front legs. These were not ideal conditions. I was leaning in a tense, uncomfortable position with my feet slipping on the branch, and I was very dehydrated and tired after mowing my yard and climbing up and down the tree a few times while untangling myself and my gear from the vines. I was straining with all my strength just to hold and maneuver the pole into position. Even if I got the noose in the right place, I would not have enough strength to lift it with the additional weight of the cat. While I was trying to position the noose properly, Spike was fighting it and getting away from it as best he could. When he slipped and was hanging by his front legs, a different kind of rescue option began to look very attractive. Underneath him was a concrete parking lot, but Becky had already put herself in position to catch him with a blanket. Several neighbors saw what was happening and volunteered to help her hold the blanket like volunteer firemen. They were ready for him, so we all agreed that the best option at this point was for me to shake the branch to cause him to fall into their blanket below. I used my weight on the branch to shake it up and down, and Spike fell. The firemen brigade below was ready for him and in exactly the right place. They did a fantastic job of catching him and softening his landing over that concrete. Spike ran off the blanket and off to the back to hide. He was perfectly fine. It is not as easy as it may appear to catch a cat in a blanket like that. It is difficult for all the people to be as coordinated as they need to be. It is easy for one person to try to move to a better position while accidentally pulling the blanket out of the grip of the others. It is also easy to underestimate how tightly you need to hold the blanket when the force of the landing cat tries to pull it out of your grip. But this volunteer group did a great job and saved a cat's life in the process. I really have to hand it to them. They deserve a round of applause. I called Becky the next day and was very troubled to learn that she has not seen Spike since his rescue. After cats fall or jump out of a tree, they typically run off to hide until they feel safe. They are anxious to return to their territory and get some food, but they usually hide for however long it takes for them to feel safe again. Some cats are back in a few minutes, while some take several hours. I expected Spike to return shortly after I left, and I am worried about him now that I know he has not been home for 24 hours. 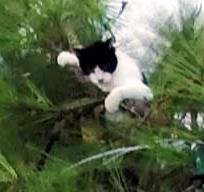 I told Becky to look around to make sure he is not stuck in another tree and to please let me know when she finds him. I will update this page when I hear back from her, and hopefully, that will be very soon. I have no video to show of this rescue for two reasons: (1) when Spike was in the vines, he was not visible, and (2) the vines got tangled in my camera and pulled it out of position. Becky just called me this afternoon to say that Spike is home! She went out to feed the other cats and found Spike waiting there with the others. He looks just fine. It's as if nothing ever happened. He is soaking up some extra loving to make up for all the time he missed lately. 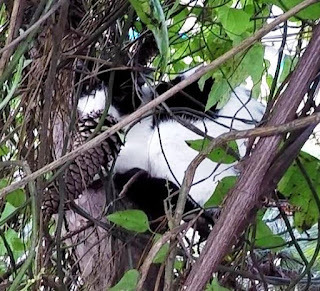 He was in the tree for four days, and now has returned home four more days after that. No word yet about where he has been or what he has been doing. Cats like to keep their secrets. I can live with that. I'm just so glad that he is home and well. So is Becky.